Roy Rogers, Bob Nolan, and Tim Spencer were the three founding members of the wildly popular singing group the Sons Of The Pioneers. The group grew to include additional members, and throughout several decades of success was known for perfecting a mesmerizing blend of harmonies with accompanying instrumentals and Western lyrics. The history of Roy Rogers and the singing group The Sons Of The Pioneers begins with a struggling young singer named Leonard Slye. Len, who would later change his name to Roy Rogers, was born in Cincinnati, Ohio in 1911. He spent most of his youth in Duck Run, Ohio, learning how to ride horses, play the mandolin and guitar, and how to sing and yodel. When he was in his late teens Len moved to California where he got a job driving a gravel truck with a construction company. When the company went bankrupt Len became a migratory fruit picker, a job that kept him broke, tired, and hungry. Longing to pursue a dream, Len quit his fruit picking job to try to become a singer. 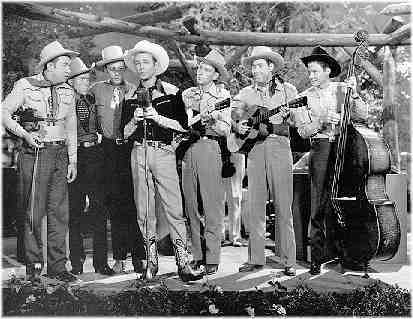 Roy Rogers (at the microphone) singing with the Sons Of The Pioneers in Roy’s movie “Idaho,” 1943. From left to right, are: Hugh Farr, Tim Spencer, Bob Nolan, Roy Rogers (at the microphone), Lloyd Perryman, Karl Farr, and Pat Brady on the bass. The day after singing on the radio for the amateur show Len was contacted by a man who was manager for a group called the Rocky Mountaineers. They were an instrumental group that needed a singer, and the man wanted Len to sing with them on a radio station in Long Beach. Even though the job wouldn’t pay – the group just hoped the exposure would lead to paying jobs – Len was dying to sing and took the offer. He encouraged them to recruit another singer for the harmonies, so they placed an ad in the newspaper. A lifeguard named Bob Nolan, who was also a guitar player, fiddle player, excellent singer, and aspiring songwriter, showed up at the door and was brought on board. Soon afterwards another singer, Bill Nichols, joined the group, and Len was pleased with their blended harmonies. The group became popular on the radio, but times were hard and no one could afford to pay them. After eight months of living mostly off of the food, shelter, and kindness provided by the banjo player and his wife, Bob Nolan left the group to become a caddy at the Bel Air Country Club. Soon afterwards Tim Spencer, another excellent singer, yodeler, and aspiring songwriter joined the struggling group. They revamped and reworked the group several times, trying to get a big break, and eventually changed their name to the O-Bar-O Cowboys. In June of 1933 the O-Bar-O Cowboys began what would turn out to be a miserable tour of the Southwest. They toured in a constantly broken down car, there were no crowds to sing to, and there was very little money or food. At one point Len borrowed a rifle and managed to hunt a “stringy jackrabbit” for one night’s supper, a hawk for the next evening’s meal, and a blackbird for the night after that. After the O-Bar-O cowboys returned to Los Angeles from their disastrous tour the group split up. Many of them quit the music business all together, with Tim Spencer getting a job at a local Safeway grocery store. Len joined another singing group, Jack and His Texas Outlaws, but he was unhappy singing with them. Len now focused his dreams on forming yet another new singing group. He talked Bob Nolan into leaving his job as a golf caddy, then talked Tim Spencer into leaving his job at Safeway. Together, the three of them made another try at making a living as singers and musicians. It was 1933, and they called themselves the Pioneer Trio. The Pioneer Trio had a magical three-part harmony accompanied by instrumentals and sometimes yodeling. They quickly got a lot of radio work with no pay, working in exchange for getting to advertise over the radio they were available for hire. A local newspaper columnist, Bernie Milligan, took a liking to the group and began to frequently mention them in his column. They began to get paying jobs, and a radio station hired them for actual money: $35.00 a week for each of them. In early 1934, while preparing for a radio performance, radio announcer Harry Hall called the group the Sons of the Pioneers instead of the Pioneer Trio. He said that the young men looked too young to be pioneers themselves. The new name stuck, and the Sons of the Pioneers, with their Western lyrics, blend of beautiful harmonies, instrumentals, and yodeling found huge success with jobs that actually paid. They not only had successful radio and personal appearances, in August of 1934 they made their first recordings, singing such classics as “Tumbling Tumbleweeds” (written by Bob Nolan) and “Moonlight On The Prairie” (written by M.K. Jerome, Joan Jasmyn, Tim Spencer, and Bob Nolan). They got a penny for every record they sold. As the group began to enjoy success, they grew to include other members including (in no particular order) the brothers Hugh and Karl Farr, Pat Brady, George “Shug” Fisher, Ken Carson, Lloyd Perryman, and others. 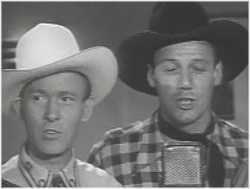 Tim Spencer and Bob Nolan singing “Cowboy Jubilee” in the Roy Rogers movie “Lights of Old Santa Fe,” 1944. 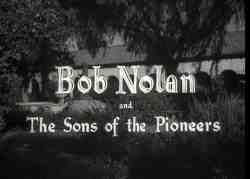 Along with Roy Rogers, Tim Spencer and Bob Nolan were founding members of The Sons Of The Pioneers. The Sons Of The Pioneers soon began appearing in movies, including a few of Gene Autry’s early films, and in 1937 they signed a deal to appear in a number of movies for Columbia Pictures. When Leonard Slye was offered a contract as an actor with rival Republic Pictures, he had to officially leave the group. In early 1938 Leonard Slye changed his name to Roy Rogers for his budding movie career, and achieved meteoric success as a singing cowboy in the movies. Although Roy Rogers had officially left the Sons Of The Pioneers he remained close to them. When their contract was up at Columbia Pictures they made the move to Republic Pictures to be with Roy, joining him as highly popular supporting players in many of the movies Roy starred in. Roy continued to perform with them frequently outside of the movies as well, singing with them on many radio shows, personal appearances, and recordings. The Sons Of The Pioneers enjoyed top-of-the-industry success for decades. From the beginning they had perfected a mesmerizing blend of harmonies with accompanying instrumentals and Western lyrics. Along with being inducted into the Country Music Hall Of Fame in 1980 the group has garnered numerous other awards and honors, including being designated National Treasures by the Smithsonian Institute in Washington, DC.